During World War II, Kin Platt served from 1943-1946 with the Air Transport Command (ATC) of the United States Army Air Force. 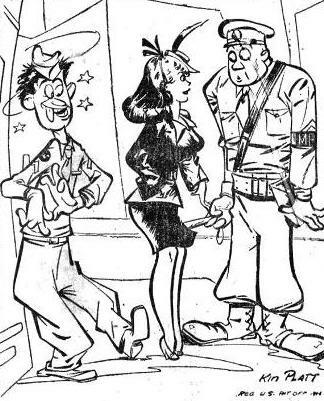 While stationed in India with the India-China Division (ICD) of ATC he used his drawing talent to create a series of cartoons called Broad Views. These cartoons appeared in the weekly newspaper, Hump Express, published by ICD's Public Relations section. Hump Express reported war news and other stories of interest related to ICD's operations in the China-Burma-India (CBI) Theater. 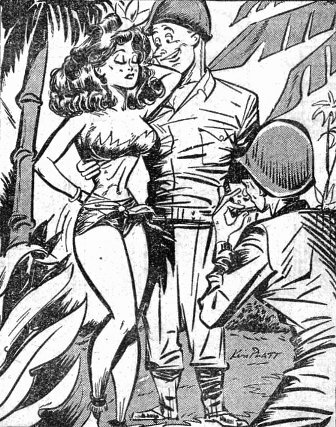 Prior to his Army service in World War II, Kin Platt had been a writer for many famous entertainers and publications. In the mid-1930s he wrote radio comedy for George Burns, Jack Benny, the comedy team of Stoopnagle and Budd, and The National Biscuit Comedy Hour of 1936. 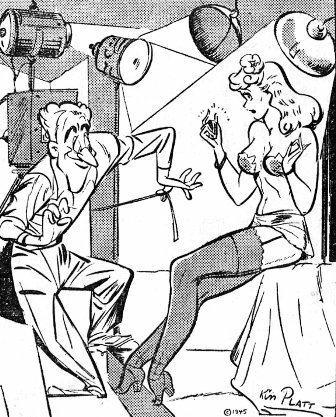 Later in the 1930s, he wrote for Disney and Walter Lantz theatrical cartoons, and he broke into comic books with humor stories featuring the character "Happy" in Better Comics. 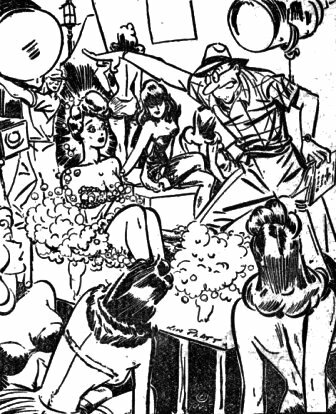 Platt went on to draw such features as "Captain Future" in Better's Startling Comics; "The Mask," featuring a district attorney turned costumed crimefighter, in Exciting Comics; and writer Richard Hughes' Doc Savage-like "Doc Strange," in Thrilling Comics. 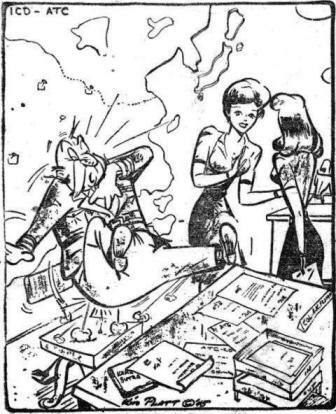 Following the war, Platt continued his career as a comic book writer/artist. 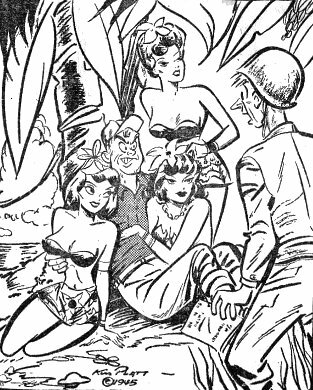 BROAD VIEWS featured beautiful women, often in various stages of undress, usually discussing some situation involving a GI. 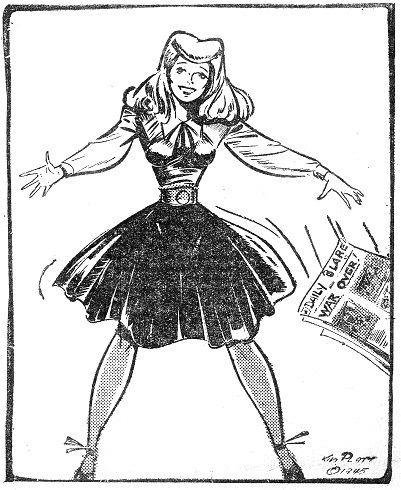 The cartoons appeared in many issues of the newspaper, gracing a bottom corner of the back page. Click on the right-hand image below to move to the next row, or the left-hand image to move to previous row. To begin, CLICK HERE. - he said it was some kind of rotation plan . . . "
"For all the money he has, he doesn't dance badly." there was a sale of lighters at his PX . . ."
and wants to see more of me . . . "
- Do you have any of our pilots?" interesting sight in India . . . "
"He wants to know if I've got anything on for tonight!" "Smile, baby - I want my wife to think I'm having a good time . . ."
"Will you tell this soldier to stop following me . . . I have a date tonight." 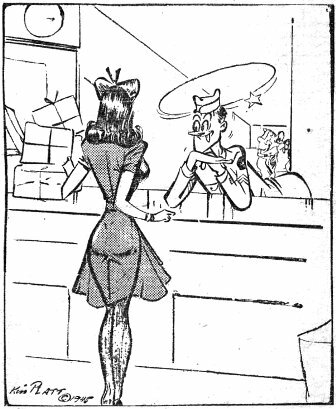 "They got my pin-up pictures and now the chaplains are calling me Miss Mental Booby Trap of 1945." "Didn't I tell you? I'm waiting for the doctor, too?" it gets you with the candy bar . . ."
"He says he's been caught with his points down!" I'm jilting two bankers instead of five." 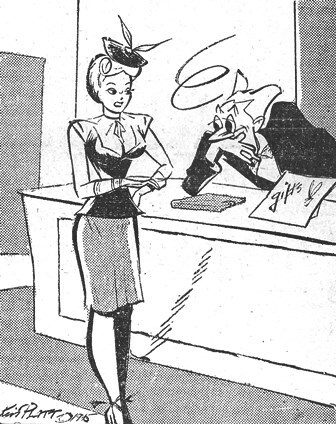 "They want you should do typing, too . . . ."
would be perfect - but 45 - wow!" and what do we have to show for it?" "Now I want to see some real acting . . . remember your son is in uniform, your husband is out with another woman and you just lost your cake of soap!" advanced ATC base in China." "I just happened to be in the neighborhood." "Would you like anything else . . . merchandise, of course?" 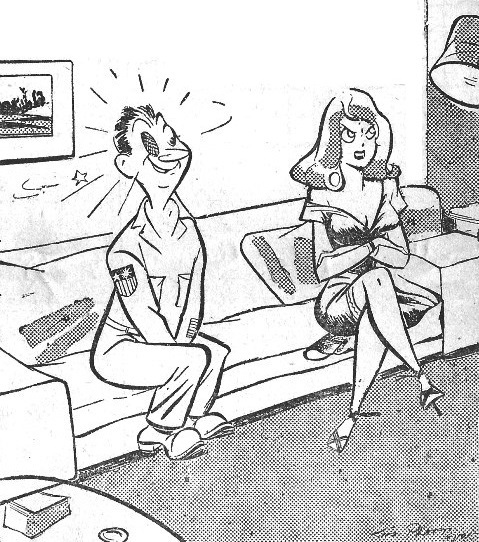 "And he told me he'd been sent home for combat fatigue!" "My replacement? Who th' hell wants a replacement?" "Gosh . . . I've dreamed about this for months . . ."
"I just had his ring appraised. Tomorrow I'm having my mind!" 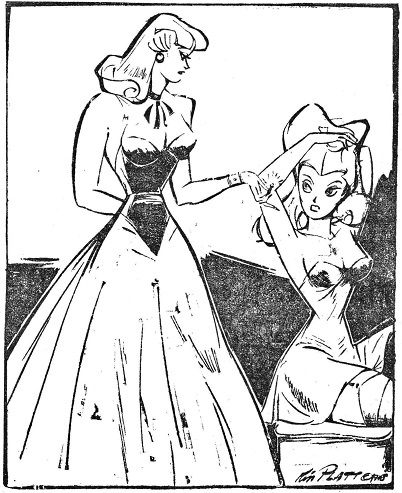 "He fell for your pin-up pictures - but how d'ya know he'll like you in clothes?" "I want him to know he's REALLY out of the Army!" "The factory foreman just told me I am no longer essential!" "The funny thing is how we happened to meet!" "Can you suggest something nice I can give my boyfriend when he comes home?" 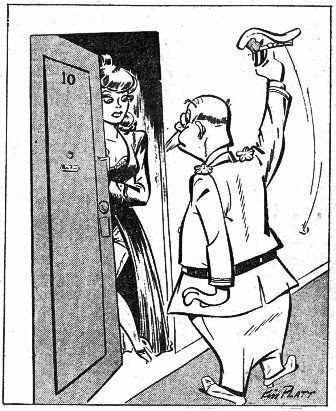 "But, Darling - don't you have any OTHER postwar plans?" "He says I've got too much make-up on!"